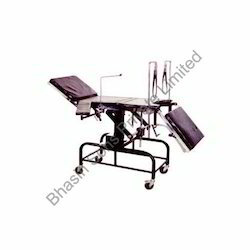 Prominent & Leading Exporter from New Delhi, we offer major head side control operation table, veterinary operation table, veterinary operation tables, electromatic remote operated multifunctional c-arm table, c-arm hydraulic table with image intensifier and side end control super deluxe hydraulic operating table. 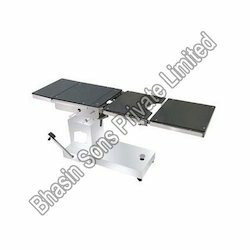 Item Code: nova-5010We at, Bhasin Sons private Limited are engaged in manufacturing and exporting a wide range of Major Head End Control Hydraulic Operation Table. We use modern technologies and machineries for the process of manufacturing operation tables. Our products are significantly featured with well-built state of dimensional precision and better performance. It finds its application in hospitals and clinic for surgical purposes. A Single Action Double Cylinder Hydraulic Pump Controlled by a Foot Pedal. Five Section S.S Top / Translucent top with large perenial cur-out for drainage Tray. Stainless Steel Base with Auto Locking System. Electrically Sealed Blue Rubberized Mattress thickness 50 mm. 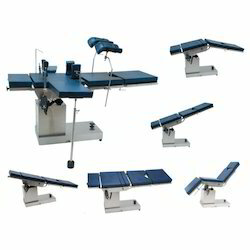 We are the leading manufacturer and supplier of Vetinary Operation Tables. 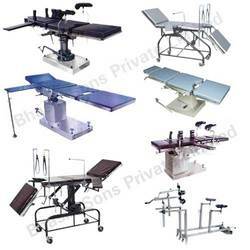 We are the leading manufacture and exporter of Veterinary Operation Tables. Under the able guidance of our skilled professionals, we offer Electromatic Operation Table all over the world. We use sophisticated technology and machinery for the process of manufacturing these operation tables. These tables are completely operated electrically, which consumes reduce power also can be operated at low power availability. It is designed in such a way that they are highly reliable and durable. The table height can be modified as required in the range from 762mm to 1012mm. 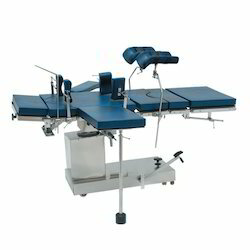 Fully Electromatic Remote Operated Multifunctional C-ARM table with image intensifier six section with kidney bridge and fullest range of position and series of a number of accessories which gives the flexibility to meet all user requirement for surgery ranging from micro to general surgery. The versality of the table makes it a reliable and comfortable to use as a universal product. Arm Rest (S.S.Top) 1 Pc. Arm Board Radiolucent Top 1 Pc. Bhasin Sons Pvt. Ltd. is one of the leading names in the field of manufacturing and exporting Operating C-Arm Table Electric. In order to meet the international competition these products are made of excellent quality raw materials. The seats arm seats are fabulously designed with cushion seat and arm rest that provides more comfort for the patients. It can be operate with greater strength and smoother operation. More over the table is mounted with castors wheelswith break for easy moving. A hydraulic operated multifunctional C-ARM table with image intensifier six section with kidney bridge and fullest range of position and series of a number of accessories which gives the flexibility to meet all user requirement for surgery ranging from micro to general surgery. The versality of the table makes it a reliable and comfortable to use as a universal product. 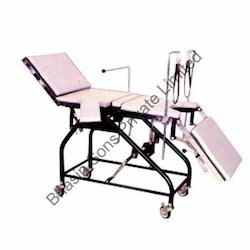 We hold the sound name in manufacturing and exporting Side End Control Super Deluxe Hydraulic Operating Table at a large scale. These are manufacture using excellent quality raw materials and components to lead the way of huge competition. The vital features of the products are Auto Floor Locking Device, Electrically Sealed Blue Rubberized Mattress thickness 50mm and Base Detachable Leg Section. We offer these products at industry leading price. 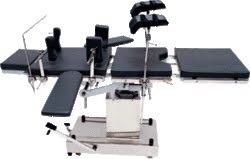 A hydralic operation table with heavy S.S. table top and fully covered heavy hydraulic central portion base with heavy steel perfect for all type of general, gynae and ortho surgery with all standard accessories of stainless steel. Having well-organized infrastructure facilities, we are able to offer C-Arm Compatible Operation Table with orthopedic attachment. We use highly developed technology and survey modules for the process of manufacturing these tables. Our products are well-known for its quality and competence. These products are designed along with x ray projection with digital display and used for the treatment of human bones effectively with utmost care. A very fine gear mechanisam for smooth functions for the tables with o-wobbing. Complete with standard accessories and special electrically sealed mattress. Padded orthopaedic knee crutches provides support to the legs of the patient. Antero-posterior screening may be carried out with imageintensifires without obstruction of the field by metal parts. Complete with radio-lucent top with removeable pelvis rest & pelvis stem x-ray lucent. Abduction bar allowing flexion/raising of legs and abduction /abduction ball joints locked from foot end. 2 dynamometric traction devices on sliding bars with ball joints allowing traction and rotation of foot with traction boots. Tables top made of transparent radio lucent fibre for x-ray. Owing to ethical business practices, we are able to offer highly efficient Gearmatic Operation Table all over the world. These products are manufactured under the supervision and utmost care of our skilled professional to ensure its defect-freeness. Our products are operated by automated gear facilities, which is highly reliability and durability. We manufacture these products in accordance to meet the huge industrial requirements. 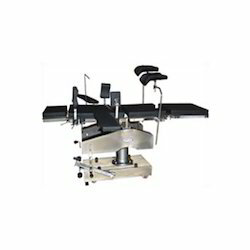 It is multipurpose Hydraulic Operation Table designed to offer quick & accurate positions. The O.T. table height can be adjusted between 787mm to 1042 mm for best posture during surgery. All positions move by full gear matic force. Fully Gear Matic, Double Action, Hydraulic Pump, Eccentric Base, four cylinder with foot pedal operation. Base Column covered with stainless steel. Leg Section and Head Section are interchangeable. Five Section Translucent Top for Radiographic Sheet. Electrically Sealed Blue Rubberized Mattress thickness50mm. Backed by the perfect state-of-art infrastructure, we manufacture and export an ample range of Surgical Operation Tables. These products are manufactured using best quality raw materials to ensure its reliability. 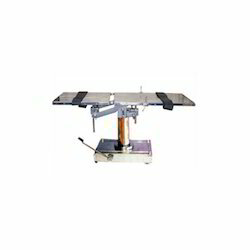 We offer a wide range of surgical tables such as Hydraulic Table, Electrical Operation Tables for use of C-Arm Image Intensifier and Surgical Operating Table Hydraulic (major head end control). It is with the provided features as Study and heavy duty base covered S.S. sheets for durability of table and foot-operated hydraulic pump duly concealed chamber covered with stainless steel. Improved hydraulic pump duly concealed chamber covered with stainless steel. Five sections S.S top, with detachable legend section; all the positions can be maneuvered from head end side by moving the handle as mentioned on the indicator dial. We are experts in manufacturing and exporting Hi-Low Table Trolley around the globe. With prior importance to maintain the quality of the products, we have installed a testing laboratory with advanced testing equipment that tests the quality of the product in various parameters. These trolleys are designed in such a way that it can be divided into three parts. The compact wheels attached so that it can be moved to the other parts. Following the guidance of our skilled professionals, we manufacture these very fine qualities Operation & Examination Table. Our range is manufactured using high grade wooden materials. These products are well-known for its steadiness, which are very user friendly and rust-free. This product is specially designed for the comfort of the students who writes their exam and also for the doctors too. This table is portable and can be fold into three parts. Under able guidance of our trained professionals, we manufacture and export a wide range of HI - Low Manually Operating Table. We have organized a unique quality management team to ensure products reliability and quality before delivering it. Our products are manufactured in accomplishment with international standards and compliances. These tables are featured with manual adjustments to lift the table higher or lower according to the requirement. 3. Standered positioning :] Height UP/Down Trendelenburg, Reverse Trendelenburg Lateral tilt sides, Flex/ Reflex chair ,Kidney Elevation and Lithotomy etc. 4. Mobile on smooth running castors. 6. Antistatic waterproof rubber mattress 50 mm. 7. Pair of SS arm beard with mattress. 9. Pair of padded lateral support. 10. Pair of padded shoulder support. 11. 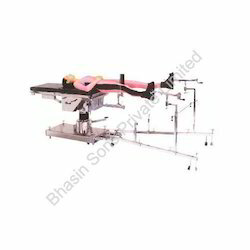 Pair of lithotomy leg holder with straps . 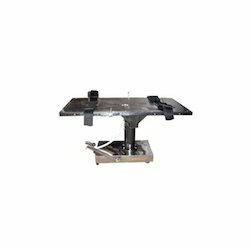 A hydraulic operation table with heavy S.S. table top and fully covered heavy hydraulic central portion and base with heavy steel perfect for all type of general, gynae and ortho surgery with all standard accessories of stainless steel. Looking for Operating Table ?